3/29/18 update: GoPro has released the new camera, simply called GoPro HERO, for $199. GoPro is releasing a new action camera, as was first seen on Reddit. This time it’s an entry-level camera with essentially the same features as Hero 6 (which has 4K video), but with a video resolution of 1440p at 60fps or 1080p at 60fps and a lower price. I believe this strategic move has important implications for the 360 camera market. The new camera looks like the Hero 5 or Hero 6 but will have 10mp photos and the video will be only 1080p at 60fps. It is available now for $199. 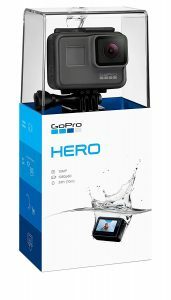 It has the same features as Hero 5 and Hero 6, including being waterproof without a case, voice command, touch screen, and compatibility with Quik stories. The only difference is that the sensor is limited to 1440p at 60fps or 1080p at 60fps, and the photos are 10mp instead of 12mp. 360 shooters may be interested in using it for a rig or for a GoPro panoramic head such as the Panohero H5B or Pano5+1 Mk II. I don’t know whether the new camera will succeed. But allow me to speculate on why GoPro is releasing this camera. 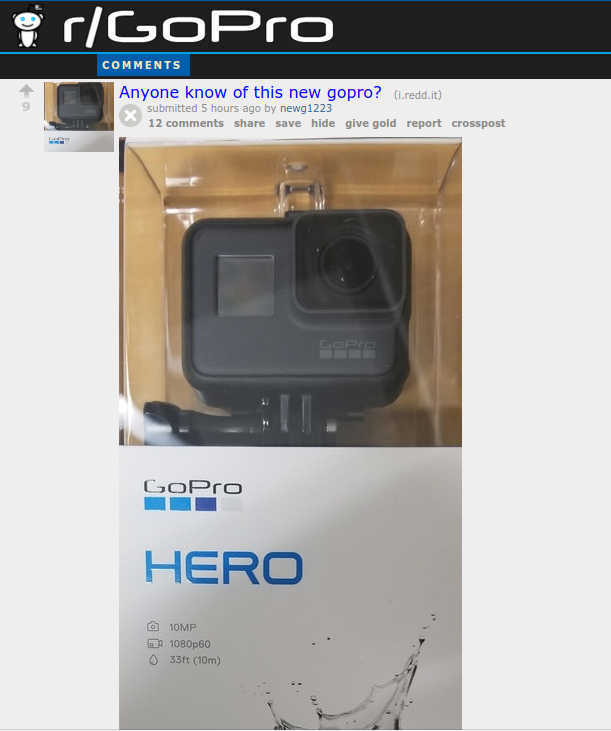 I think GoPro has figured out that the majority of their users watch videos on their phone or a laptop or a computer monitor, not a large screen TV. With a laptop screen or smartphone, at normal viewing sizes, 4K is not noticeable. Even on a 20-inch screen, the difference should be noticeable only if you have 20/20 vision. If most people won’t need the 4K resolution, why not get a lower cost 1080p camera instead? Besides the lower camera cost, it will be faster to upload the video, it will take up less space on a drive, and easier to edit. Now hold that thought. If 1080p is “good enough” for most people this means that the threshold for acceptable image quality might not be as high as we previously assumed. To get the equivalent of 4K resolution in a 360 view, a 360 image must be around 32K. To get the equivalent of 1080p resolution in 360 view, however, you need only about 8K. In fact, the GoPro Fusion is only 5.2K but comes close to the detail of the 8K Insta360 Pro. I’ve also compared the Fusion to 1080p videos from a smartphone and a Hero5, and found that the Fusion videos could at least be somewhat similar, when you use a suitable field of view. In turn, this reinforces the idea that consumer 360 cameras — or at least the GoPro Fusion in particular — have reached a video quality that is “good enough” for most people, especially if they are viewing videos on a smartphone, laptop, or typical computer monitor. If the Fusion offers similar image quality to the new GoPro Hero, the question is, would a consumer pay around $500 more to get similar image quality but with new capabilities, such as the ones I showed in my GoPro Fusion review? I think it’s a reasonable proposition, and as 360 cameras increase in quality or decrease in price, the proposition can only become more attractive. If this is simply a 1080p camera, GoPro should lower their price to $100. There’s a lot of competition on this market. hi Remy. True, the $200 price is still a bit high. Perhaps it will have a better sensor, better stabilization or other features that would make it better than the competition. The hurdle of adoption for cameras is the rendering time on PCs. If I shoot 360 to then use things like Overcapture etc. (which most of consumers will eventually want to do), then processing and cutting the final video will have to go down in time and in complexity. Basically enough to run on a normal notebook. That’s one more reason why 1080p video is so popular and why people want 4K, but won’t use it. You don’t need a dedicated graphic card and an i7 processor to create videos, and rendering doesn’t take hours. Thanks Thomas. I agree — right now the editing hardware is a little higher than what most consumers have. But little by little, they are converging. PCs are becoming more powerful, and so are smartphones. Fusion needs better overcapture on their mobile software so that people won’t even have to edit on a desktop. In that regard, Insta360 One has reached that point, imho. Their 4K videos can be converted to overcapture in their app without having to stitch. And the smartphones that can do it are relatively modest (e.g. iPhone SE or above). If Fusion can do that, it would truly be the ultimate 360 camera (for video at least). Smartphone editing works nicely for single clips, but not so much for larger projects. From my perspective, the future should not exclusively be in having to move the files physically from the camera to the phone, then again having to move them to the desktop (or notebook). For larger projects, a better workflow is to move them to the PC (or insert the SD card), pair phone and desktop, and then via an app use the phone only as a controller to find the optimal viewing angle (alike to what Insta360 is offering), but do the rendering on the PC. Would you be able to use this with the panohero as well? Hi Mark! Yes you can! The resolution will be a bit lower but the quality will still be very high. It looks like a slightly stripped down Session Hero 5 Black with H5B packaging. I went through the release support files (all of them) on the GoPro website. 10 Mpixel 3648*2736 (same as Session) 1080*1920 (30/60) and 1440*1920 (30/60 fps) No GPS. One thing that jumped out at me was no GP1 processor so in Session/H5B camp . My guess it has some real merit. H5B/H6B case and avoids most of the software problems that I have seen in H5B with lower video data rate. It should be able to have quite good stabilization. From a user point of view the lower expectations and lower complexity should have lower support. Price higher than it should be but in the right range. It will not open a new markets like the Sony RX0 for third person story telling for example. Thank you very much Walter! I’m kind of curious to see if it is indeed like a Session 5. I’m thinking about whether to get one to test. Facebook Messenger now supports 360 photos!